Just simply inflate ring and fill with water! If the seam has come apart, this can be difficult to fix with repair patches. If you are still within the warranty period, please contact the After Sales team to process a warranty claim. Fast set pools must be set up on level ground. The pool needs to be filled to 80% capacity. Over exposure to sunlight can cause the top ring to expand and become deformed. The fast set pools should not be placed in direct sunlight, unfortunately this is not covered under the warranty. Does the pool come with a pump to inflate the top ring? No, they do not come with a pump to inflate the top ring, this will need to be done by mouth. 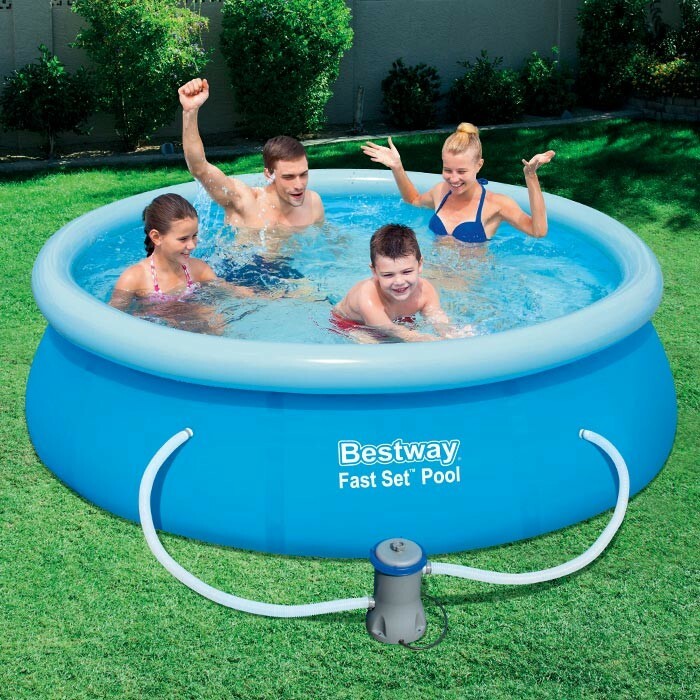 The fast set pools need to be set on flat and level ground. Why don't the bottom or sides inflate? The sides and bottom are not designed to be inflated, only the top ring needs to be inflated, then the pool can be filled with water. Why is the pool lopsided or bulging? This is normally caused when the pool is not on flat or level ground. This can also be caused by over inflating the top ring. The pool should be filled to the 80% capacity. We would recommend using chemicals to maintain the health of your water, this will also mean the water won't have to be changed as often. This can be caused by excessive chemical use. If this is the case, this would not be covered under warranty. The pool should be cleaned with a mild soap and water solution, such as washing up liquid. It is recommended that the pool is stored in a cool dry place across the winter period as the cold weather can damage the PVC walls. The pools should be cleaned and thoroughly dried before being stored. Connect the adapter to the hose. Screw the valve of the hose adapter onto the valve cap.